To the side of a main road that runs parallel to the Garonne, connecting Bordeaux with the Médoc wine-growing territory, a 19th-century place of worship is slowly crumbling into nothingness: la chapelle Saint-Jean-des-Palus, now also known as Saint-Jean-de-Lavenelle. The chapel was built in 1872 to the designs of architect Louis Garros to serve a congregation made up of people who lived in the surrounding so-called “palus” riverside quarters, where the agricultural parcels of land were frequently flooded by water from the Garonne. The then-owners of the nearby Château de Grattequina (also designed by Louis Garros), the Gièse family, were behind the original idea to create what they hoped would become a bona fide parish church. The most detailed account of the chapel’s history can be found on the Porte du Médoc website, which also features an incredible picture that shows how the neo-gothic chapel once looked, complete with belfry, ornate windows and a well-trodden lane leading up to the wooden door. 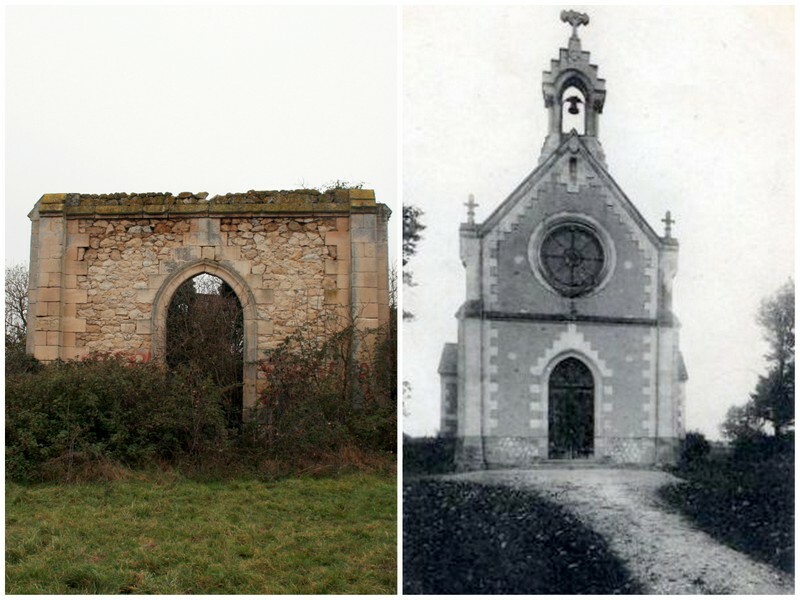 The chapel today and the same entrance when the chapel was in its prime (credit CPA fonds privé Césard, source: Porte du Médoc). 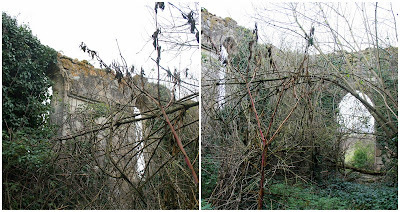 Today the chapel is but a shadow of its former self: just four walls remain and vegetation has gradually taken over every square metre of the edifice. Instead of casually strolling up a lane I had to crawl under some barbed wire fencing, no doubt breaking some by-law in the process. So what has happened to the chapel over the years? In 1880, the plans to create this new parish were debated at Saint-Martin church in Blanquefort. The boundaries were drawn up and 513 potential parishioners were identified in the catchment area. Despite vocal opposition from the mayor of Blanquefort, the creation of the new parish was greenlighted by the religious authorities, on the understanding that the church would function independently without ever having to request support from Blanquefort. Although the creation of the administrative parish was never finalised, the chapel began operating as an autonomous concern, with a small house being built alongside as a residence for the clergyman. However, it soon became clear that the church would not be able to survive alone, and it became a branch first of Saint-Rémi parish in Bordeaux, and then the Blanquefort parish. By the time of the First World War, the church ceased operating and then gradually fell into a state of disrepair. The chapel was closed for good in 1934 and the upper part of its structure was dismantled to avoid any form of accidental collapse. And that is more or less how things have remained ever since, the chapel having been left to fend for itself. The view inside the chapel today! An interesting subplot has taken shape though. The land now actually belongs to the Bordeaux dock authority (Port Autonome de Bordeaux, or Bordeaux Port Atlantique) which, between the wars, acquired huge stretches of riverside land with a view to building a canal so that boats heading to and from the Atlantic would not have to contend with the Gironde’s fluctuating tides. The project has been on permanent standby, no doubt stalled by the owners of the lucrative wine-growing châteaux in the area. However, the docks have yet to relinquish their grip on the land. 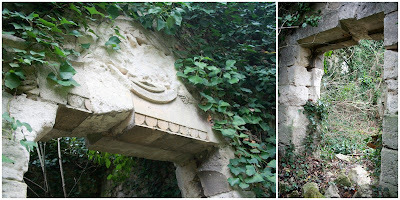 Bordeaux sculptor Pierre Kauffmann has expressed an interest in purchasing the chapel in ruins, and other movers and shakers have drawn up (but since abandoned) grand plans to renovate the premises and turn it into a dynamic seat of art and learning. Everything remains at a standstill though and, in the meantime, the chapel remains in a sorry state, deteriorating a little more each day. Who knows what the future might hold for the place. Can it still be brought back to life? Find it: Avenue de Labarde, Blanquefort. Big thanks to Harvey for suggesting this subject and to Porte du Médoc for directing me to information about the chapel.